The Director of the Ultrasound Education Group and cardiothoracic surgeon, Alistair Royse, performed the surgery, the first of its kind in Australia. The patient who had an enlarged aorta, the largest artery in the body would normally have required invasive open-heart surgery and lifelong blood-thinning medication. However, the new medical procedure is less invasive and reduces patient recovery time. The personalised external aortic root support (PEARS) procedure used 3D technology to create a lifesize copy of the patient’s aorta. Using this, an open-mesh sleeve to match the patient’s aorta was made. During the two-hour surgery, Dr Royse placed the mesh sleeve over the patient’s aorta to prevent it from further enlargement. Traditionally, an alternative operation would insert an artificial aortic graft which may include a built-in valve and involves stopping the heart temporarily during a six-hour procedure. “This is less invasive because you’re not having to go on a heart-lung machine which exposes the blood to a large amount of plastic and so the blood gets severely activated. By avoiding the bypass machine the patients are expected to recover more rapidly”, said Dr. Royse. The PEARS procedure has been performed less than 200 times worldwide since 2004. It lowers the risk of the patient requiring further surgery and does not require the patient to take blood-thinning medication for the rest of their life. Recovery time can be just a few days, rather than several weeks because there is no change to the aorta or aorta valve. “The traditional operation actually cuts out a part of the blood vessel and replaces it with a plastic tube. This is actually trying to preserve the normal internal lining of the blood vessel”, said Dr. Royse. The procedure was born from a personal need of an English engineer. When Tal Golesworthy discovered his aorta was expanding at a dangerous rate because of Marfan syndrome, he began searching for an alternative treatment option for aortic dilation. 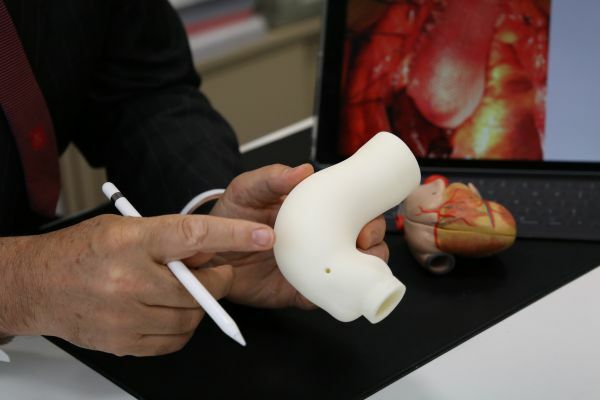 Through collaboration with medical professionals, he engineered the idea of scanning the aorta and creating a reproduction to wrap around the aorta. In 2004, he became the first patient to be implanted with the device that he had invented. Dr Royse believes the procedure will become more common once underpinned by more research. “If the treatment itself is lower risk that will start to change the dynamic of where you intervene. So you begin to do things earlier”.